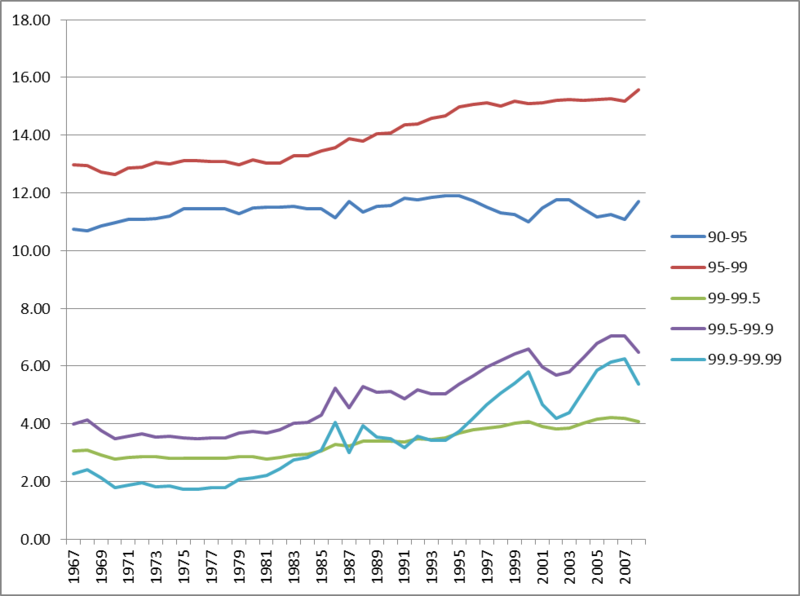 Certainly the rich are getting richer, but what does that mean exactly? We know that it is not a zero-sum game as some would have it. The amount paid on basic expenses is going down for all. And the rich do not exactly sit on their money and buy all kinds of toys. Some do perhaps, but some do not, and some are quite adept at making capital work well. What any economy needs is to select the best use of capital investment. The very rich do many things to increase the good in society, from jobs to new industries to social causes. Take Bill Gates for instance. He is not a strong supporter of a free enterprise system but has benefited quite nicely from it. life’s work has now become to take this fortune and make a difference in the world, using his analytical problem solving approach to do so. The rich and poor compare well against the international community. 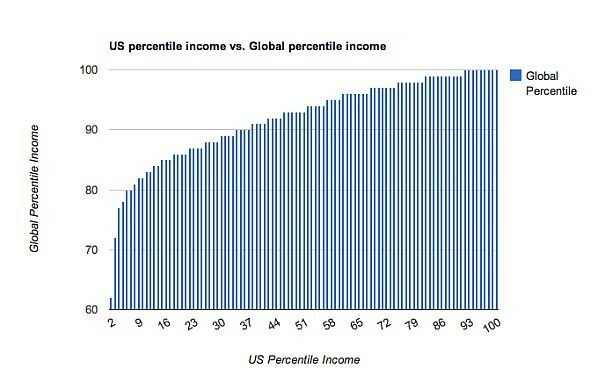 Even the low level of income in the USA is above the 80 percentile level elsewhere, as shown in the graph at right. The data reveal that, after one year, roughly half of those who were millionaires at some point between 1999 and 2007 remain. After the second year, 15% or roughly 102,000 millionaires remain. This decreasing rate of remaining millionaires persists, and only about 6% or 38,000 millionaires remain after the ninth year. So what is the background of the top 1%? In the graph at right, the background is quite diverse. The non-finance executives is nearly a third and so on. Medical doctors do well before taxes and perhaps expenses. The top 400 from Forbes in the recent report contains 25% Financial investors and heads of firms, with the remainder being owners or near owners of businesses like Gates and Buffet. 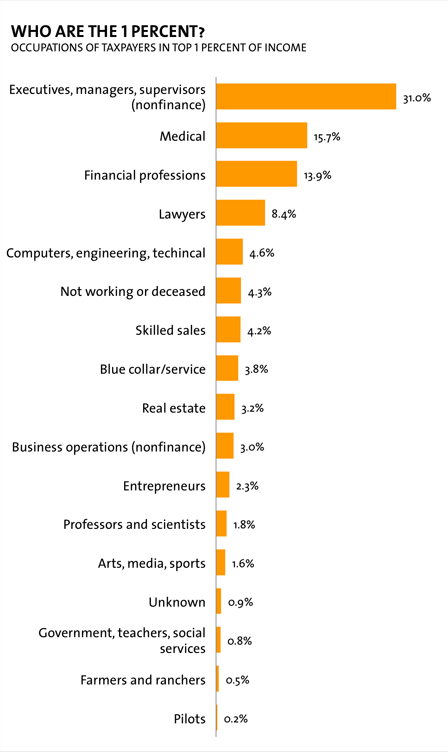 There are a few CEO's and not many athletes or media stars, but more than 50% are Democrats. The percent share of wealth for the Top 0.1% is shown below. It has dropped from earlier years to be fairly constant at about 10% of the total. The graph below indicates that this upper 0.1% receives about 4% of the income share. This and the data for the graph of wealth at left is from Spreadsheets. The rich however at the highest end (the Forbes riches 400) of the spectrum at right are 25% finance managers and the rest are owners of businesses. 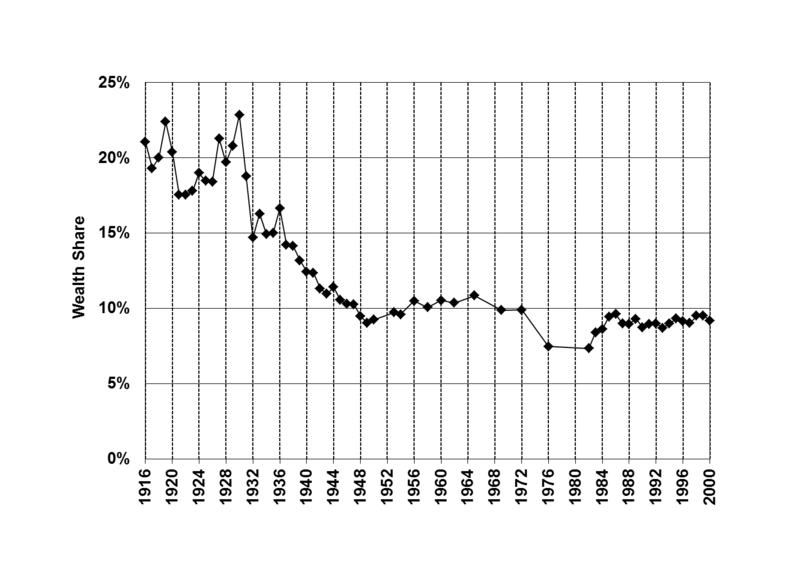 We can see in the graph at left of income share for the upper fractiles that this is not a rapidly changing curve as a percentage share. However the highest Fractile did receive more income share beginning in the mid-80's, as was discussed previously on the change in the tax code. Certainly those that are in these fractiles due to government cronyism cannot be commended for their merits. Those that are have gained popularity like Steven Jobs seem to live by another standard, safe from the perils of being seen as rich. As was detailed in "Outliers", being at the top of the ladder of wealth due to high tech took a lot of work, great timing and luck, and of course the right products. Many tried at roughly the same time or earlier or later, but the results were not the same.